Below you will find directions to the City of Howell including a map of the Downtown and Public Parking Lots. Take I-696 West toward Lansing. Merge onto I-96 West toward Lansing. Take the CR-D19 exit (Exit 137) toward Howell/Pinckney. Turn left onto CR-D19/Pinckney Rd. Take CR-D19/Pinckney Rd/Michigan Ave. to Grand River Avenue. The main four corners of Downtown Howell is at Michigan Avenue and Grand River Avenue. Take I-96 East. Take the CR-D19 Exit (Exit 137) toward Howell/Pinckney. Turn left onto CR-D19/Pinckney Rd. Take CR-D19/Pinckney Road/Michigan Avenue to Grand River Avenue. The main four corners of downtown Howell is at Michigan Avenue and Grand River Avenue. Take I-96 West. Merge onto US-23 South via Exit 133 toward Detroit/Ann Arbor. Take the M-59 exit (exit 67) toward Howell.Turn left onto N. Michigan Avenue. Take N. Michigan Avenue to Grand River Ave. The main four corners of downtown Howell is at Michigan Avenue and Grand River Avenue. Take I-96 East. Take the CR-D19 exit (Exit 137) toward Howell/Pinckney. Turn left onto CR-D19/Pinckney Road. Take CR-D-19/Pinckney Road/Michigan Avenue to Grand River Avenue. 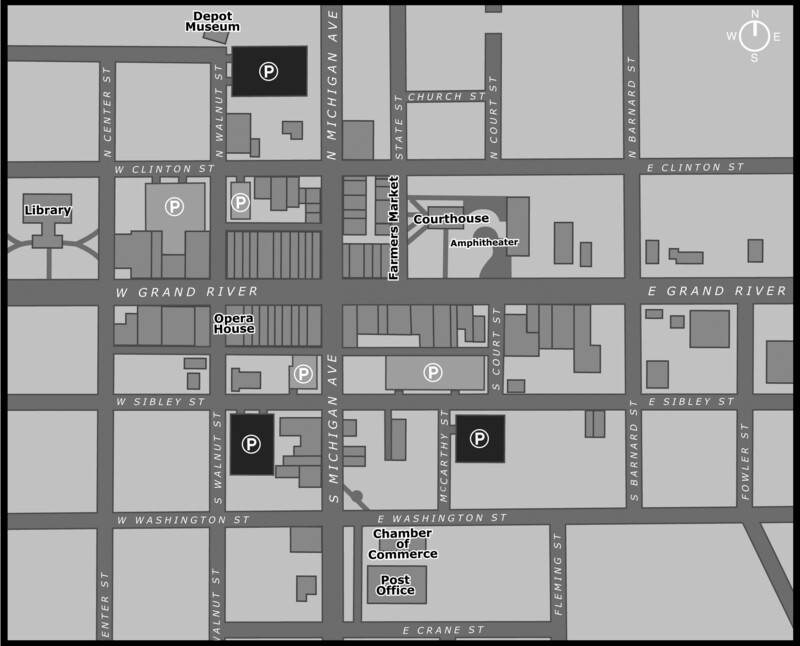 The main four corners of downtown Howell is at Michigan Avenue and Grand River Avenue.